Located 14 miles south of Sun Valley, (SUN) is easily accessible from the gateway cities of Seattle (SEA), Los Angeles (LAX), San Francisco (SFO), Denver (DEN), Salt Lake City (SLC) and Portland (PDX). These airports are served by most major airlines and are met by Sun Valley’s connecting carriers: Horizon Air (Alaska Airlines) and SkyWest (Delta Connection and United Express). United Airlines (operated by SkyWest) offers daily, direct, non-stop Regional Jet Service between Sun Valley and San Francisco and between Sun Valley and Denver for the Summer Season and Ski Season. 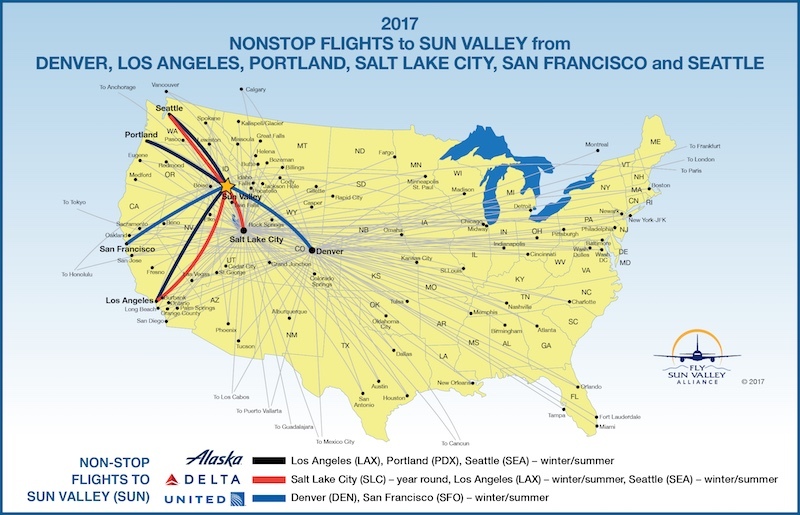 Alaska Airlines (operated by HorizonAir) now offers daily direct, nonstop flights between Sun Valley and Los Angeles and Seattle, putting west coasters just a few hours away from Sun Valley. Delta (operated by SkyWest) flies approx. 10 times a day to and from Salt Lake City and Sun Valley. 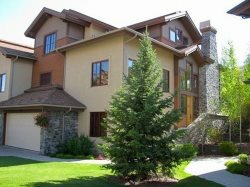 A 2.5 - 3 hour drive away- many travelers opt to fly into Boise International Airport (BOI) and rent a car or take the Sun Valley Express Shuttle to Ketchum / Sun Valley. Most major airlines service BOI allowing for a broader and more economical selection of flight options. An easy 1.5 - 2 hour drive away, TWF is a popular and convenient option for many Sun Valley visitors. Heading due north for 86 miles, it is a straight shot into Sun Valley with no mountain passes. Less expensive than flying into (SUN) with a shorter commute than Boise, Twin Falls is a great option. Take I-15 N out of Salt Lake City (71 miles; 1 hr) continuing straight to I-84 W towards Boise (144 miles; ~2 hrs). Take exit #173 toward Twin Falls/Sun Valley and turn right onto US Hwy. 93 N. (21 miles; 30 min). Continue North onto N Greenwood St / Hwy 75 N through Shoshone, Bellevue, Hailey and into Ketchum (55 miles; ~1 hr, 20 min). Take I-84 E toward Mountain Home (43 miles; 45 min). Take exit # 95 for Hwy 20 toward Mountain Home/Fairfield(.4 miles, 1 min). Turn left at Hwy 51 N / Sun Valley Hwy/ US 20-E and continue east (82 miles; 90 min) Turn left onto Hwy 75 at the stoplight continuing north through Bellevue, Hailey and into Ketchum (26 Miles; 40 min).